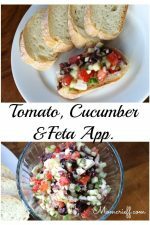 When I was given the recipe it was described as a tomato and cucumber with feta appetizer. 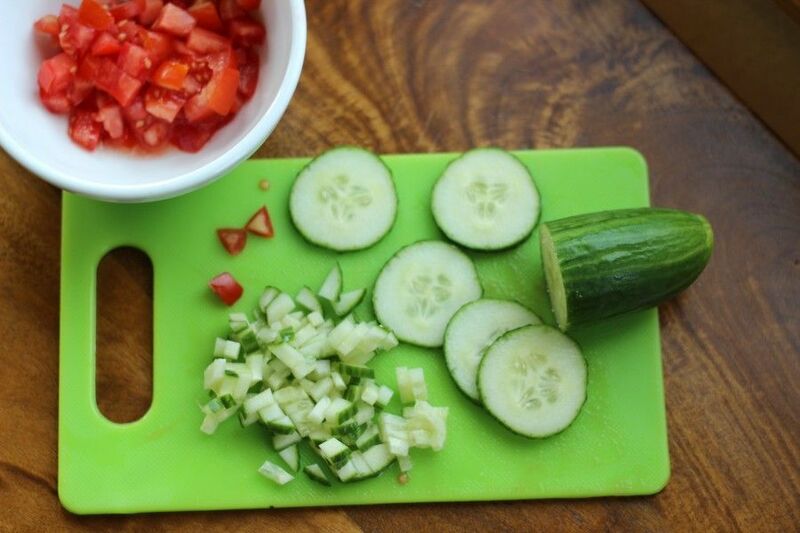 If you love fresh tomatoes and cucumbers, then this appetizer is for you. That name has stuck. 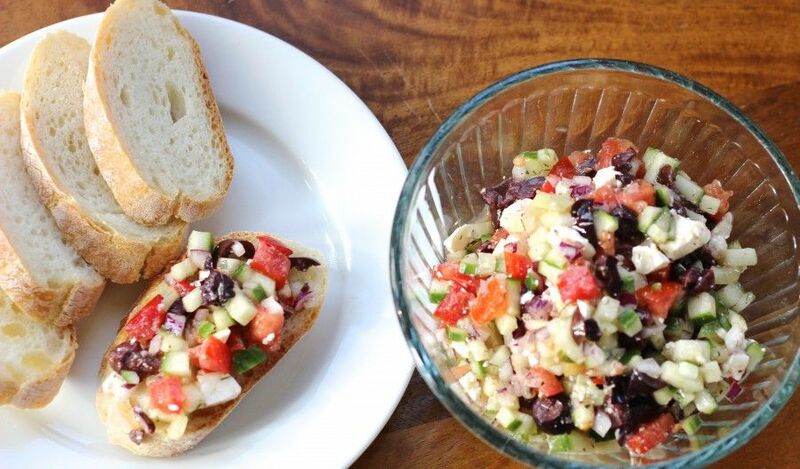 It could be called a Greek dip or a Mediterranean dip. Whatever you choose to call it, it’s just sooooo good. 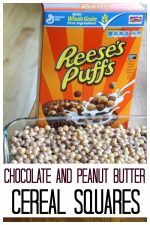 I’ve had and loved this recipe for years! Actually, I saw that I entered it in a file on my computer 5 years ago. 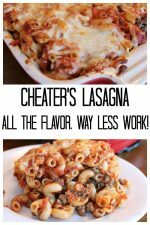 It’s simple, it uses fresh ingredients and it’s good! Our neighborhood had a Bunko group. Now, Bunko was never my thing. But, I liked the ladies in the group. So, whenever I knew the hostess well enough, I would invite myself over for the social hour (I brought a bottle of wine, of course). This is where I first tried Magaly’s appetizer. It just tasted so fresh and flavorful. Then Magaly told me it was easy! Since it’s cucumber and tomato time in my garden, I figured now is a good time to make and share this recipe. Chop everything up in similar sized fine pieces. Put everything together in a bowl. 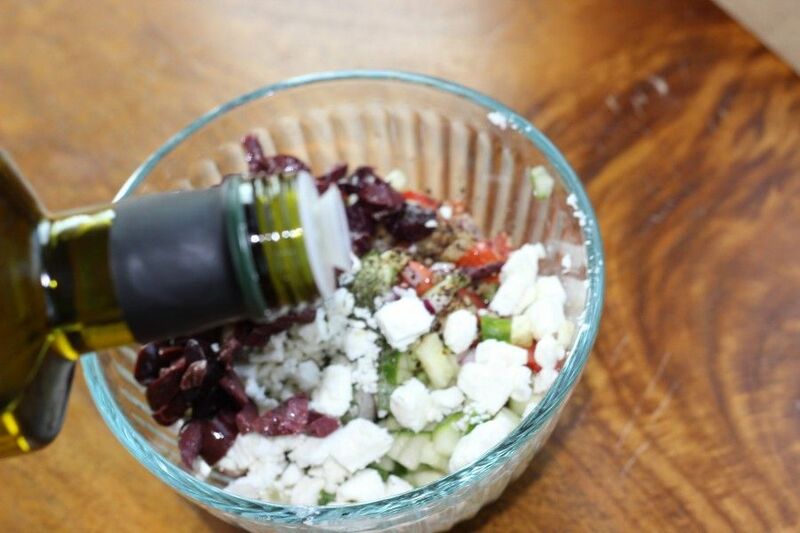 Squeeze half a lime and drizzle some olive oil on your ingredients. Serve with thinly sliced baguette slices. But, don’t put the tomato & cucumber mixture on the bread ahead of time. It kind of makes your baguette go soggy. Guess how I know? Also, it makes it much easier on you if your guests help themselves. Trust me! This recipe is easy and really good. The bonus is the main ingredients are plentiful and fresh now. Try it. In spite of being super healthy, you’ll be amazed at how much you’ll like it. Chop all ingredients to a similar fine size. 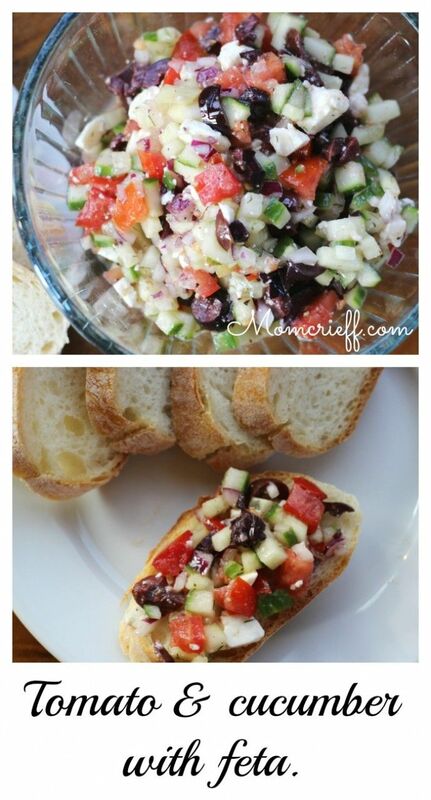 Serve on thin slices of baguette, pita chips or pita crackers. Thanks so much Magaly for giving me this recipe years ago! Hey, did you know I love Pinterest! I pin all my blog posts to my Pinterest boards. 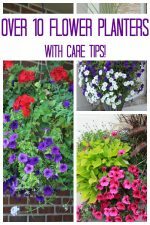 Click the button below to follow me on Pinterest. 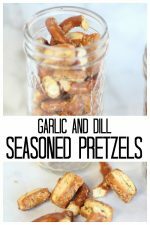 Here are a couple more great recipes! « Chocolate Chip Cake Brownies – one bowl! @imarancher – These are the nicest comments anyone could have ever written! If you lived near me, I’d be buying you lunch!! This is one of the few blogs I follow. 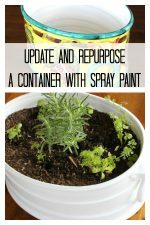 I enjoy the recipes and other DIY projects. They are quick and slick and serve a purpose with style. Very nice and very practical. I worked all my life and did not have time nor any desire to turn my house into a collection of overworked arts and craft projects. Your suggestions always produce a good product with minimal efforts. This blog is just right for me. Thank you.